Mozi (c.470-391 BC), also known as Mo-Tzu or Micius, was a philosopher who lived in China during the period of the Warring States. The philosophy he founded, called Mohism, argued against both Daoism and Confucianism. Mohism was popular for a time in China, but it was eventually replaced by the Confucianism that it opposed. 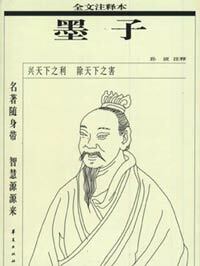 Mozi, like Confucius, was born in the Chinese Lu state, which is now Shandong Province. Not much is known about his life, but his family did not seem to be wealthy. Mozi made a living as a carpenter whose skills and inventiveness were sought after by leaders, especially military leaders who prized his fortifications. He also ran a school for would-be government officials and at one point was a government official himself in Song state, which is now Henan. Mozi was taught Confucianism when he was a boy, but then he rejected it for being too mired in ritual and passivity. He felt adherence to these virtues would hold people back. He believed that self-knowledge and being true to the self was superior to blindly following rituals, and he urged self-discipline and frugality on his followers. He believed that people could direct their lives through careful observation. Mozi’s philosophy had the impartial love of humanity, or jian’ai, as its bedrock and he was known for his altruism and pacifism. Even Mencius, who was a follower of Confucius and wrote glowingly of him, was impressed by Mozi’s selflessness. His philosophy compelled Mozi to visit various princes and potentates and urge them to forswear the wars they continually waged and planned. In at least one instance, Mozi succeeded in persuading a king to cancel a war. Mozi also rejected the Confucian idea that placed family and clan above other relationships. He believed that love should be impartial and everyone should care about everyone else to the same degree. People, including Mencius, misinterpreted this as a belief that one should not care about his or her own family any more or less than a stranger. But Mozi’s philosophy posits that it is impossible to love a stranger if a person does not love the people who are near to them. He believed that people were naturally good and it was Heaven’s will that human beings love each other and that this communal love would benefit all of society. He also believed that reward for goodness and punishment for bad behavior came from Heaven. Mozi’s ethical system judges something according to how much it benefits the state. He believed that the people in a society should have peace, enough wealth to have their basic needs met, and, in an era where plagues and famines were common, a robust population. He found everything else that did not contribute to these things to be superfluous. The book Mozi was a compilation of his thoughts, but since Mohism all but disappeared from China, copies of the books were lost, fell into disrepair, or were forgotten until recently. For example, Sun Yat-Sen used Mozi’s idea of agape, or jian’ai, in his conception of a democratic China.